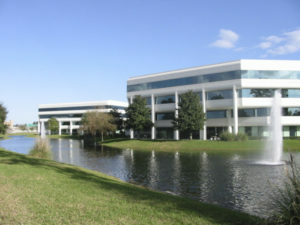 The modern Virtual Office Jacksonville is located in the South of Jacksonville and very easy reachable over the Interstate Road 95. Only thirty minutes driving time from Jacksonville International Airport. The freestanding building is situated in an office park, offering about 32,000 sq ft of A-Class executive office suites and corporate office space. The surrounding lush landscape and water ways add to the professional image. Plenty of parking warranties the ease of access and departure for your customers. The executive office suites can be leased on a monthly, weekly or daily bases, as long as you maintain at least the basic virtual office plan. Choosing the Virtual Office Jacksonville services only, enables you to register your business under your designated address, as well as receive mail under your companies name. Sign up for additional virtual office services like live telephone answering service or secretarial services.